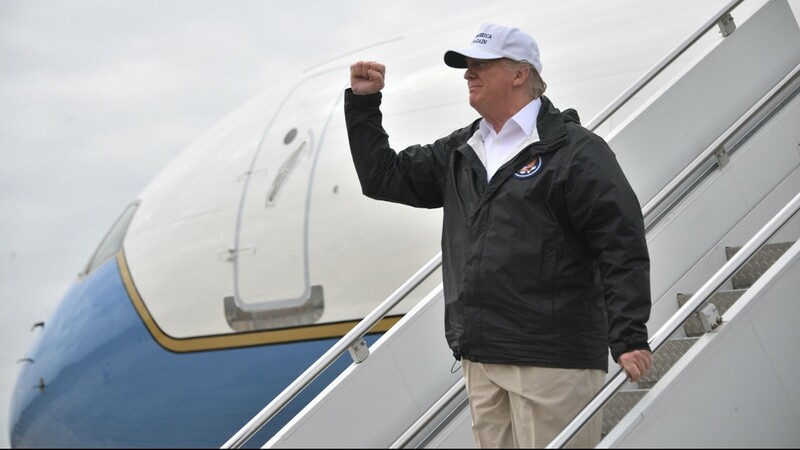 President Trump visits the Texas border Thursday amid a stalemate with Democrats and the threat of a national emergency declaration. President Donald Trump threatened on Thursday to declare a national emergency to circumvent Congress if he can't reach a deal with Democrats to fund his promised border wall. He arrived at the U.S.-Mexico border to draw further attention to his case after negotiations with lawmakers blew up. Asked about a national emergency declaration, Trump said as he left the White House for Texas, "I'm not prepared to do that yet, but if I have to I will." He contends such a declaration would allow him to direct the military to begin wall construction. "So we're either going to have a win, make a compromise —because I think a compromise is a win for everybody— or I will declare a national emergency," he said. In perhaps an ominous sign for those seeking a swift end to the showdown, Trump announced he is canceling his trip to Davos, Switzerland later this month, citing Democrats' "intransigence" on border security. He was scheduled to leave Jan. 21 to attend the World Economic Forum. Trump's comments came a day after he walked out of a negotiating meeting with congressional leaders — "I said bye-bye," he tweeted soon after — as efforts to reopen the government fell into deeper disarray. Affected federal workers face lost paychecks on Friday, and more people are touched every day by the rollback of government services. 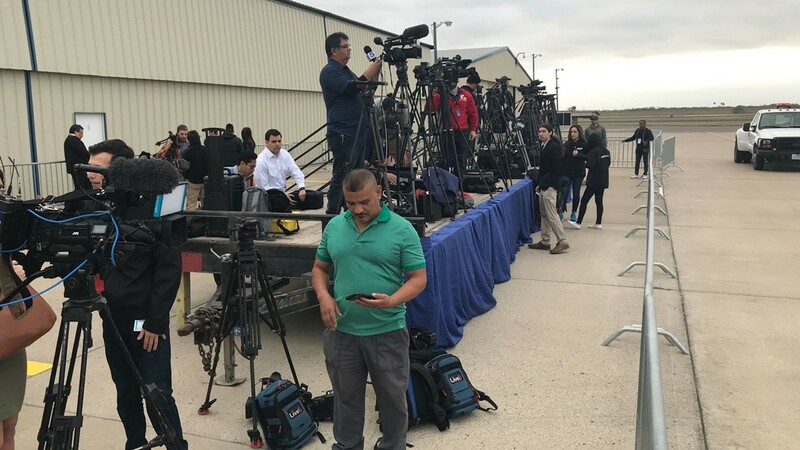 In McAllen, Texas, Trump will visit a border patrol station for a roundtable discussion on immigration and border security and will get a briefing. But he has expressed his own doubts that his appearance and remarks will change any minds as he seeks money for the wall that's been his signature promise since his presidential campaign. Speaker of the House Nancy Pelosi fired back in a press conference Thursday, accusing the president of engaging in political games to fire up his base. "I think the meeting was a set-up so he could walk out," she said. US President Donald Trump arrives at McAllen International Airport on January 10, 2019, in McAllen,Texas. 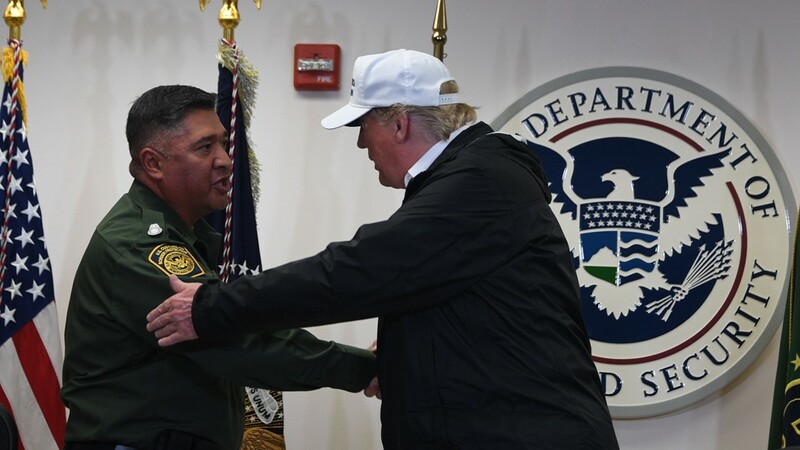 US President Donald Trump embraces a Border Patrol agent during his visit to US Border Patrol McAllen Station in McAllen, Texas, on January 10, 2019. 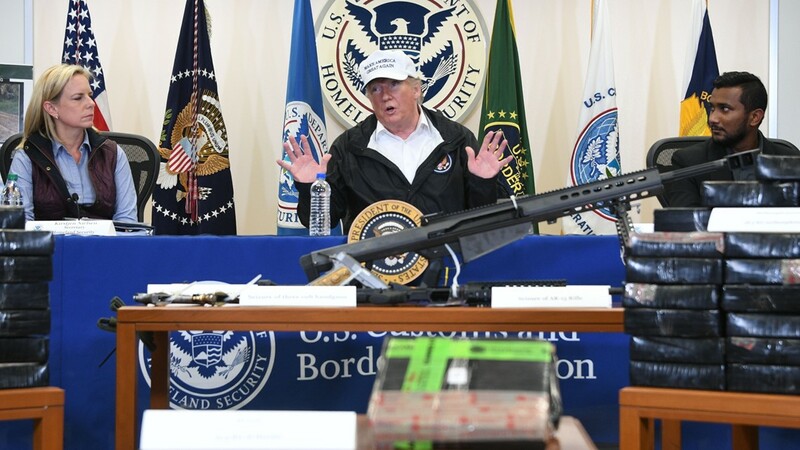 US President Donald Trump (C), with Homeland Security Secretary Kirstjen Nielsen (L), speaks during his visit to US Border Patrol McAllen Station in McAllen, Texas, on January 10, 2019. 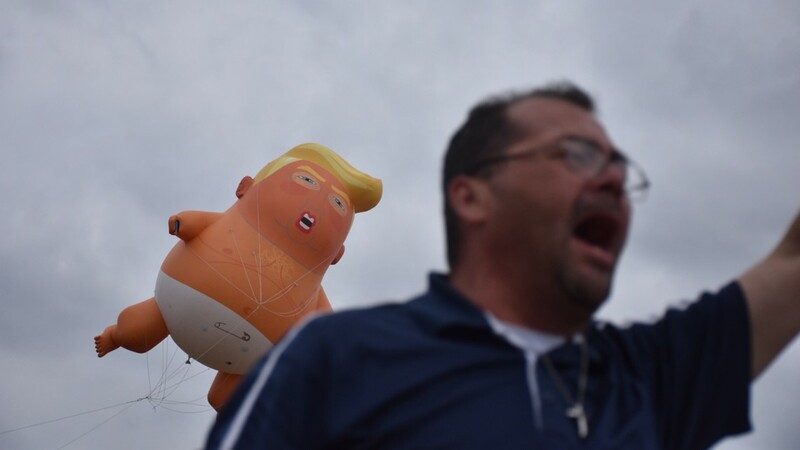 Protestors hold balloons depicting President Trump as a baby ahead of his arrival in McAllen, Texas, on January 10, 2019. 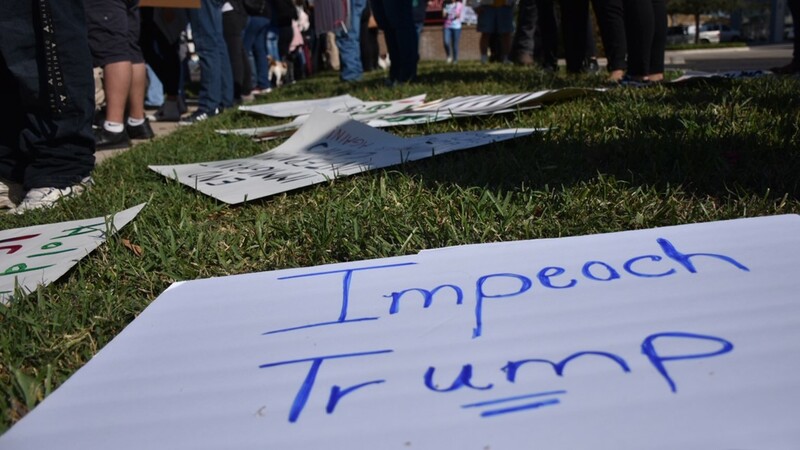 A sign reading "Impeach Trump" rests on the ground ahead of President Trump's arrival in McAllen, Texas, on January 10, 2019. 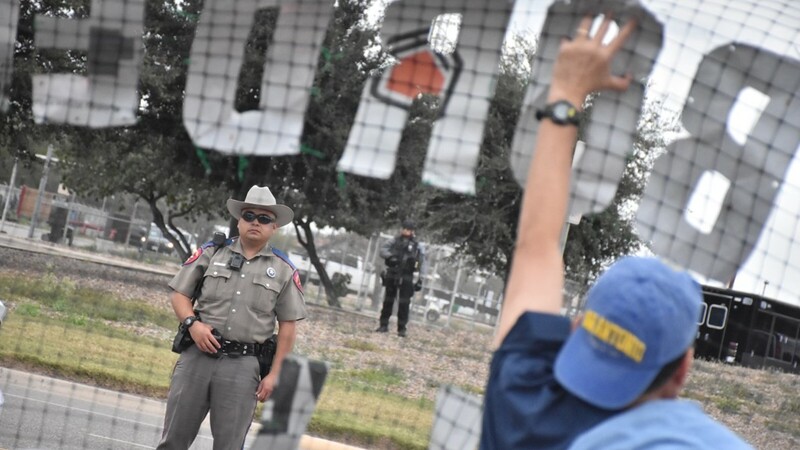 A protestor holds a sign reading, "Oppose Trump's wall," ahead of the president's arrival in McAllen, Texas, on January 10, 2019. 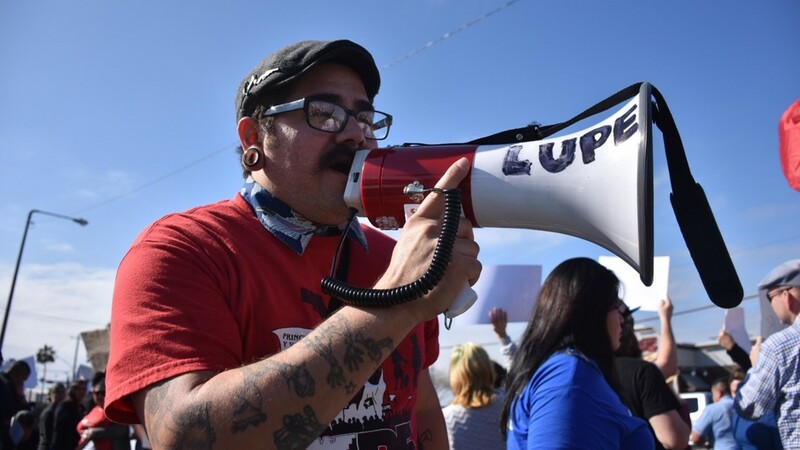 A person holds a megaphone ahead of President Trump's visit in McAllen, Texas, on January 10, 2019. 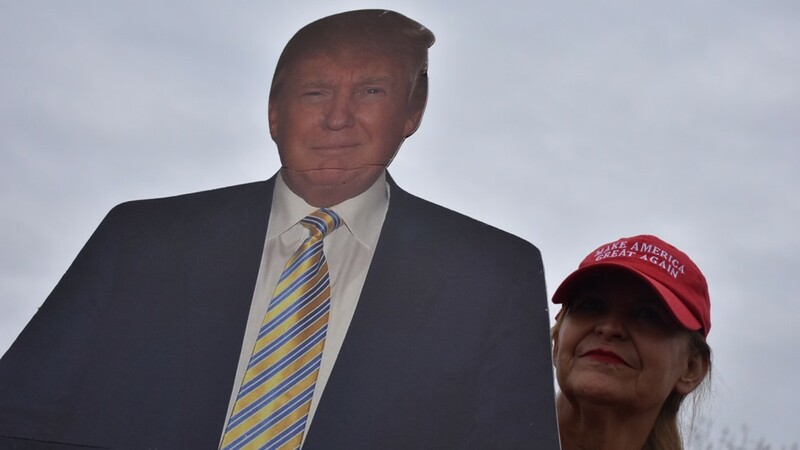 Someone holds a sign supporting President Trump's proposed border wall in McAllen, Texas, on January 10, 2019. 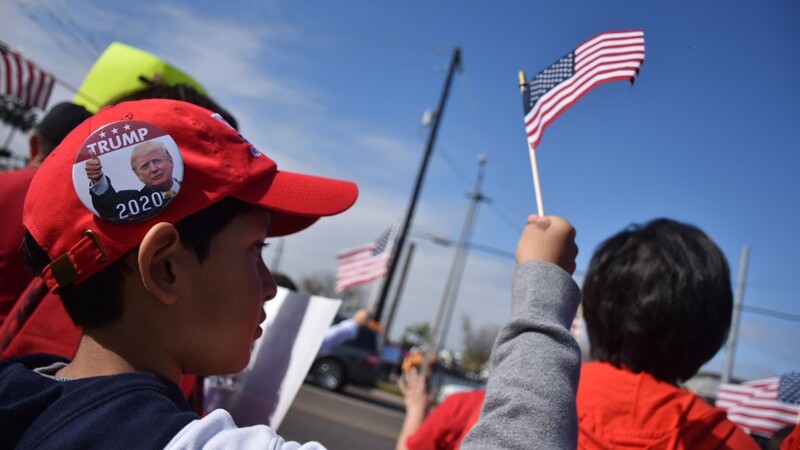 A boy holds an American flag ahead of President Trump's arrival in McAllen, Texas, on January 10, 2019. 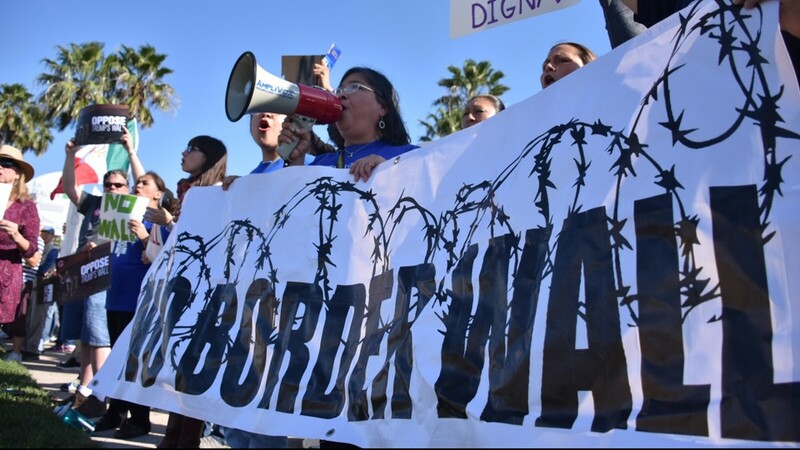 People protest against a border wall ahead of President Trump's visit to McAllen, Texas, on January 10, 2019. 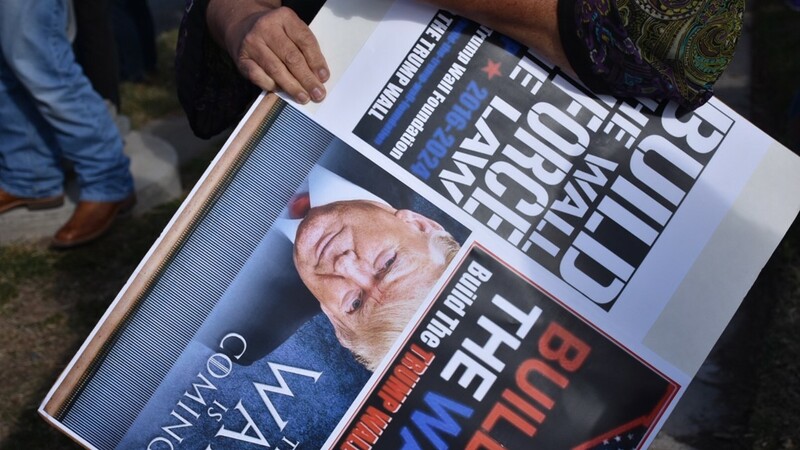 A woman holds a printout of President Trump during the president's visit in McAllen, Texas, on January 10, 2019. People protest against President Trump's border wall during his visit in McAllen, Texas, on January 10, 2019. 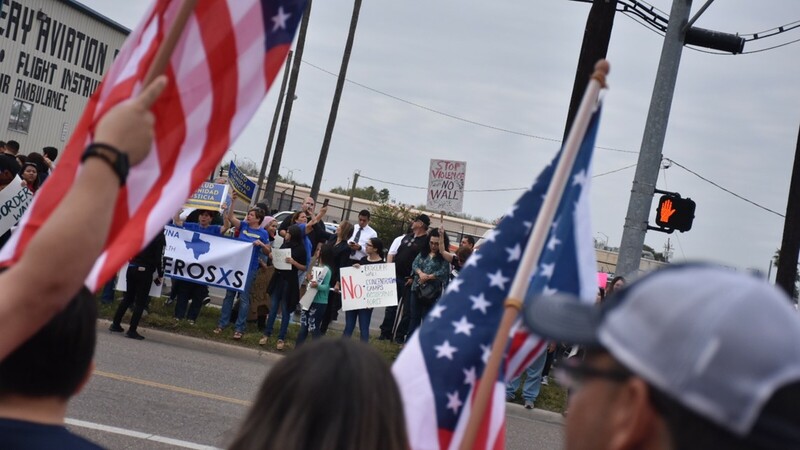 People protest outside of a building where President Donald Trump had a meeting on border security in McAllen, Texas, on January 10, 2019. 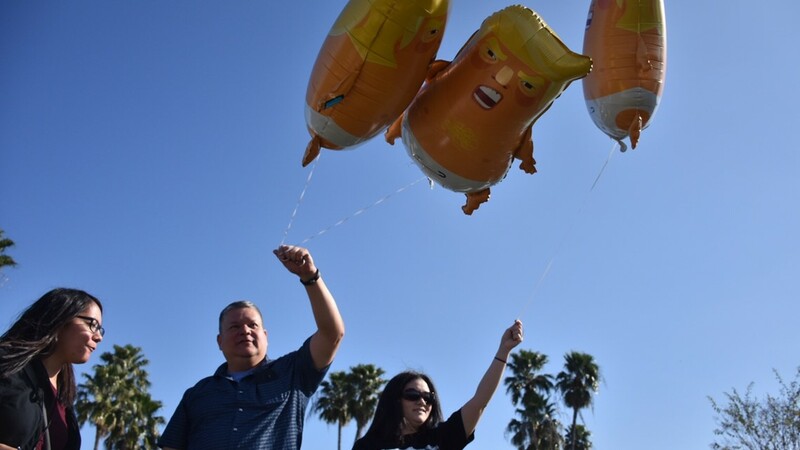 People protest during President Trump's visit to McAllen, Texas, on January 10, 2019. There's growing concern about the toll the shutdown is taking on everyday Americans, including disruptions in payments to farmers and trouble for home buyers who are seeking government-backed mortgage loans — "serious stuff," according to Sen. John Thune of South Dakota, the No. 2 Senate Republican. 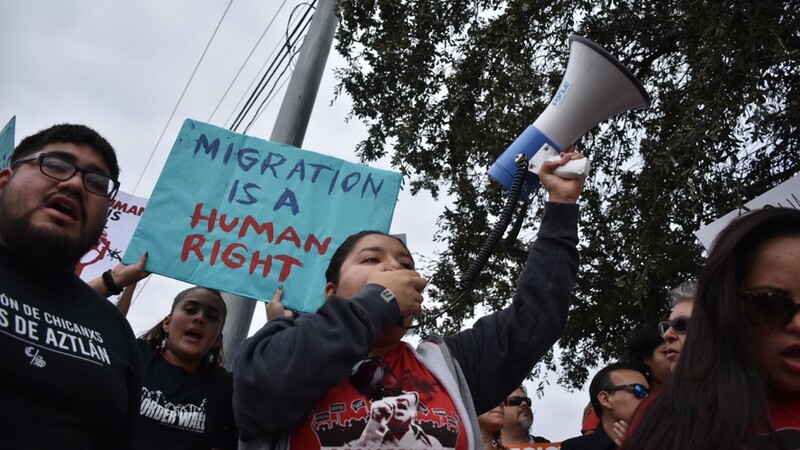 Associated Press writers Jill Colvin, Colleen Long, Alan Fram, Deb Riechmann, and Zeke Miller in Washington and Nomaan Merchant in McAllen, Texas contributed to this report.